So you want to pass the Principles and Practice of Engineering (PE) exam but don’t know where to start? Advance your career and take the guesswork out of the equation by enrolling in a top-rated PE review course to help you pass the Professional Engineer exam on your first try. To help you save time, we’ve researched and ranked the best PE exam prep courses for you below. You should consider the number of practice questions, how long you’ll have access, and whether a live or on demand course best suits your schedule and learning style, along with any additional support options provided by these PE review courses. This comparison chart summarizes the different features of leading PE study materials, so you’re sure to find one that works best for you! 15-day satisfaction guarantee but no offer to repeat the course for free. Sheer Number of Options: PPI literally has something for everyone. They stand out for their comprehensive resources for every single PE exam. You’ll be hard pressed to find another company with so many options that can be mixed and matched to fit the needs of any learner. Enter your exam date and your study plan will be designed for you, take a diagnostic test to pinpoint areas that need the most work, and create your own quiz from the many practice questions in their online database. You can even select an additional OnDemand course for just $99. Live Classes, Office Hours, and Targeted Practice: Attend lectures in person or in real time by logging in from your computer. Ask your instructor questions during lectures and office hours instead of waiting around for someone to get back to your email or forum post. Reputation and Consistent Success: As one of the oldest PE prep companies (they’ve been around since 1975), PPI has a long history of helping millions of test takers prepare for the PE, FE and SE exams. 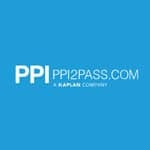 It’s worth noting that global test prep leader Kaplan Professional acquired PPI in May 2018. The Bottom Line: PPI is our top choice because of the many different options that cover every PE exam available. Their new “Learning Hub” platform is popular with students signed up for the computer-based PE exam because it closely simulates the computer-based exam experience. Choose a last minute prep pack, a discounted practice bundle, or take a depth course that is tailored to your specific PE exam. Whether you need practice with breadth or depth exams, PPI has a course for you! Cuts out the Clutter: This no-frills course focuses exclusively on what you need to know to pass the Civil PE breadth exam. 10 complete theory modules with video lectures and 150+ video example problems form the core of this concise yet effective course. Bang for your Buck: Even the Ultimate package is reasonably priced. At just $997 it covers access for an entire year: all video lectures, a growing library of video-solved problems, 2 full-length breadth practice exams, a depth exam of your choice, and 20 additional theory questions. Plenty of Practice Questions: Ultimate Civil PE offers two full breadth exams and one depth exam of your choice. Past test takers found the breadth exams particularly useful. There’s simply no substitute for practicing as many exam-like questions as possible. 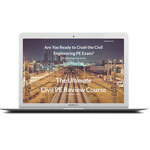 Civil Engineering PE only: This review course only covers the Civil Engineering PE exam. Anyone preparing for the other PE Engineering discipline exams (Chemical, Electrical, Environmental, Mechanical, etc.) should look at PPI2Pass or School of PE and their broader selection of prep materials. The Bottom Line: This course is best for students with a solid background in engineering fundamentals who want great practice questions and a streamlined review of what’s covered on the PE Civil Exam. However, it isn’t recommended for those who’ve been out of the classroom for a while and need a more comprehensive review. Choose the Ultimate package rather than the Lite ($247/month) and Basic ($697 for 6 months) because they don’t include as many practice questions or exams. Great Ratings and High Pass Rate: Engineering Education and Training (EET) gets great feedback from test takers for both the breadth and depth tests in various engineering disciplines. EET boasts a pass rate of 80-85% for students who attend all classes, do the homework, and complete the simulation exams. 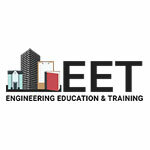 California engineers will appreciate the specific EET seismic and surveying classes, which come highly recommended. Instructors: Past students rave about EET’s top notch and passionate instructors. The small group of knowledgeable instructors is consistently praised for caring about their students, providing helpful and effective strategies to use on the test, and for answering individuals’ questions patiently and promptly. Price: EET’s options are very reasonably priced, especially given their incredibly knowledgeable instructors and high pass rate. The Civil PE breadth course costs between $550-$650 depending on the option you choose (On Demand Webinar, Live Webinar, Live Seminar). The depth courses cost an additional $550 (On Demand)/$600 (Live Webinar). Seismic and Survey courses are even cheaper at $525/$375. The Live seminar is only available in Sacramento, but the Live Webinar is nearly identical. Limited Courses: This California-based company offers great classes, but only for a select number of PE exams, including the PE Civil breadth and depth, the California PE Seismic Principles Exam, and the California Engineering Surveying Exam. If you need to take a different engineering PE exam, try a different prep company. 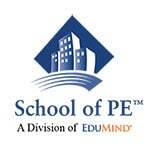 The Bottom Line: If you’re taking the CA specific PE exams, signing up with EET is a no brainer. The low cost coupled with excellent instruction will give you an edge on exam day. It’s also a great option for the breadth and/or depth portions of the PE Civil exam because of the top notch reference binder and knowledgeable instructors who go above and beyond for their students. Choose from a live in person seminar (Sacramento only), live online webinar (using Adobe Connect) and on demand video webinar. You’ll also get unlimited access to videos until the day of the exam. Experienced Instructors and Affordable: TestMasters PE Review comes highly recommended by those who’ve passed the PE exam. Former students in various states report that the Live Classroom, Live Online, and On-Demand courses are extremely well-taught. Complex topics are explained in a straightforward way by highly qualified instructors and; practice problems are geared towards tackling those on the test quickly and accurately. Amazing Reference Notes/Binder: The TestMasters PE binder and reference notes get stellar reviews. Many test takers report that they used these as their main (or only!) resource on the day of the test. It’s essential to have everything you need for the test organized and at your fingertips instead of hauling in a huge stack of books on exam day. Common Reference Books and Practice Exams Not Included: Although many prep courses include the most popular reference manuals that you will need to study and answer practice questions, the Test Masters price does not include reference books or practice exams. The Bottom Line: Test Masters alumni credit their instructors’ coaching and specific strategies for helping them ace the test. Although Test Masters may not offer the bells and whistles of the more well-known PE prep companies, their tried and true approach has worked for many who failed after taking a more comprehensive review course first. Comprehensive Review and Course Options: Rivaled only by PPI in content and specialization of instructors, School of PE has long been a favorite for those who want a comprehensive list of options. There’s a course for every Professional Engineer exam in a variety of formats: On Site, Live Online, and On Demand. Well-Organized and Helpful Reference Notes: Test takers rate the course notes as one of the most valuable features. They are well-organized and extremely helpful as an exam reference. Even students who skimmed through the long video lectures and griped about specific instructors said the notes were excellent. High Pass Rates and Tutoring: School of PE reports a high pass rate (typically 80-90% or more of their students) for first-time exam takers who attend all refresher sessions and workshops. (See actual pass rates for each exam on their website). Unlike most other review courses, tutoring sessions can be purchased for additional support: $125 for 1 hour or $500 for 5 hours. Instructors get Mixed Reviews: Some say that the notes are more helpful than the video lectures and live instruction, depending on who is teaching the course. Although School of PE hires a number of different instructors so that specialists are teaching the various courses, not all instructors get great reviews. The Bottom Line: School of PE offers comprehensive options for test takers, including a full menu of live, on site and on demand courses. The study notes are excellent and it’s the only program we reviewed that provides tutoring. They lose points for quality of instruction, and reports that the breadth course is more useful than the depth course.